The NBA preseason is underway, with a mix of teams playing their best players while others preferring to slow it down early. The Oklahoma City Thunder lost against Real Madrid, and so did the Chicago Bulls at home to the Milwaukee Bucks, featuring their new Wade-Rondo- Butler trio. The Toronto Raptors lost at home to the Denver Nuggets despite playing both Kyle Lowry and DeMar DeRozan, while the Portland Trail Blazers handled the Utah Jazz with C.J. McCollum and Allen Crabbe doing most of the work. 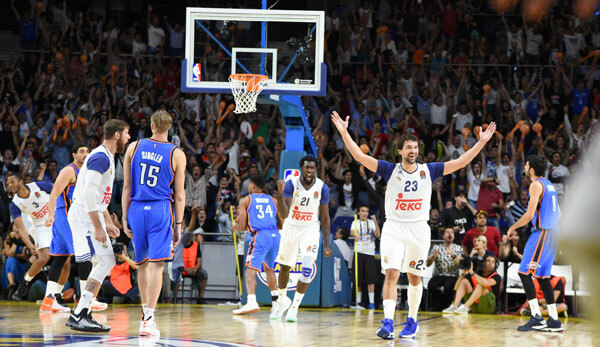 Oklahoma City Thunder 137 Real Madrid 142: A three-point barrage by the Spanish team, boasting NBA-caliber talent with Rudy Fernandez and other players who haven’t necessarily been to the best league in the world, gave them the lucrative win over the Thunder. Victor Oladipo scored 34 points in 33 minutes but was 1-for-7 from beyond the arc. Russell Westbrook took it easy with a 22-minute game, scoring 18 points. Enes Kanter added 29 off the bench. Rookie Domantas Sabonis played against the club his father starred for, starting, scoring 7 points in 29 minutes. Milwaukee Bucks 93 Chicago Bulls 91: Rashad Vaughn hit a 3-pointer with 39 seconds left to win the game for the Bucks, featuring Vaughn and Malcolm Brogdon starting in the backcourt, while Miles Plumlee started at center, alongside Jabari Parker and Giannis Antetokounmpo in the frontcourt. The Bucks bench outplayed its lineup, getting a team-high 15 points and 9 rebounds from Greg Monroe in 17 minutes. The Bulls played Rajon Rondo, Dwyane Wade and Jimmy Butler in the lineup, with Butler leading the team scoring 13 points, 8 of them from the line. Rondo had 7 assists, Wade scored 6 in just 12 minutes of basketball. Orlando Magic 97 Memphis Grizzlies 102: The Grizzlies outscored the Magic 6-1 to win the game, led by 15 points from Wade Baldwin IV off the bench, not playing Chandler Parsons, while getting 10 points each from Marc Gasol and Mike Conley. Evan Fournier led the Magic with 18 points, as they featured Bismack Biyombo next to Nikola Vucevic in the lineup. Serge Ibaka didn’t play. Charlotte Hornets 88 Dallas Mavericks 95: The revamped Hornets featured no Cody Zeller or Kemba Walker, led by 13 points from Frank Kaminsky off the bench. The Mavs played without Dirk Nowitzki, Andrew Bogut, Deron Williams and Devin Harris, setting the stage for Seth Curry, scoring 20 points in 22 minutes off the bench. Denver Nuggets 108 Toronto Raptors 106: The Nuggets pulled away in the finish, with their European frontcourt of Danilo Gallinari, Jusuf Nurkic and Nikola Jokic doing well, especially Nurkic with a 15 points, 10 rebounds double double. Jonas Valanciunas scored 20 points in 19 minutes for the Raptors, starting both Kyle Lowry and DeMar DeRozan, getting 15 points from DeRozan. Terrence Ross led the team off the bench with 23 points. San Antonio Spurs 86 Phoenix Suns 91: The Spurs ran to a 15-point lead in the first half before easing up on the Suns, and were led by Kawhi Leonard, scoring 17 points, with almost all their key players (Especially those over 30) getting the night off. Devin Booker led the Suns with 19 points, getting a bad night from Dragan Bender who scored nothing, while Marquese Chriss added 10 off the bench, redeeming the freshman honor. Utah Jazz 89 Portland Trail Blazers 98: The new look lineup for the Jazz struggled, and the lineups with Joe Johnson and Boris Diaw especially had issues against the Blazers. Portland were led by 16 points from C.J. McCollum and 15 from Allen Crabbe.